Mobile web browsing is the next big thing. At least that’s what the pundits say. Recent data shows there are about 4 billion mobile users (almost half the planet) (source). In 2011, smartphone sales will surpass desktop/laptop computer sales, moving over 400 million units per year (source). But haven’t we heard this all before? Hasn’t the mobile web been the “next big thing” for each of the last several years? What gives? It doesn’t really matter that 4 billion people have mobile phones unless they are using them to browse the web. In previous years, two big factors have prevented the mobile web from taking off like everyone thought: inferior hardware and sub-par web browsers. The iPhone changed both for the better in 2007. Smartphones have taken a giant leap forward in the last three years and mobile Safari has led to several WebKit-based mobile browsers being developed. So thanks to the iPhone and several other mobile innovations that proceeded it, mobile is for real this time. 25% of those 4 billion people are using the web from their phone today. (source). Do we need a dedicated mobile site or just a mobile-optimized one? What browsers do we optimize for? How can we test them? Should we use a mobile framework? If so, are we depending on it for the UI? Which mobile framework is the best fit for my project? Which frameworks work best for building a native app? One clarification to be made is that iPhone and iPod Touch are treated separately above, but they are both the same browser from a web developer’s point of view. So if their market share is combined appropriately, it comes in ahead of Opera by 3.34%, making it the market leader. Opera is a big deal now because it’s platform-independent, available on most smartphone operating systems including iOS, Blackberry, Android, Windows Mobile and Symbian. Opera Mobile v10+ and Opera Mini v5+ (different browsers) both have solid web standards support. Opera also provides excellent developer tools for testing. A few other browsers are not big players at the moment, but are worth keeping an eye on. SkyFire tops the list, available on Android and iOS devices. It recently made headlines for generating over $1 million after only three days on the app store, forcing Apple to temporarily disable sales for a short time because of the demand. SkyFire is known for it’s social media integration and ability to convert flash video to a native format that can be seen on the iPhone. Firefox Mobile is another up-and-comer. It’s available for Nokia N900 phones or any Android 2+ phones and is based on the same technology as Firefox 4 for the desktop. It boasts great video support (including flash), social sharing features and even user agent switching for more advanced users. Even Microsoft’s Windows Phone 7 is holding it’s own alongside iOS and Android browsers. So even a browser with the infamous “Internet Explorer” name gets a fresh start in the mobile space. Luke Wroblewski was the first to boldly proclaim that we should design websites for the Mobile First. Luke argues that designing for mobile first helps you focus on the most important elements since you have such limited screen space. He also says that mobile phones are now capable of more than desktop browsers, such as location-aware features and multi-touch gestures. So why not have the full arsenal of capabilities available to you when designing? For a great run-down about media queries, check out “Responsive Web Design”, an article by Ethan Marcotte. The viewport meta tag is the newest and most powerful when it comes to mobile, allowing developers to share the width/height of their content with the browser and control how the content is allowed to be zoomed/scaled by the user. Most modern mobile browsers support this tag. Apple gives a nice overview of what the viewport tag is capable of and also details a few iOS-specific tags in their HTML reference library. While it’s not required, most great mobile experiences start with a framework. They help developers create rich, interactive mobile sites with minimal code and are optimized for several platforms out of the box. Popular frameworks also have growing communities, dedicated to improving the product across different browsers as the technology rapidly evolves. The days of fixed-width websites are numbered as mobile becomes more of a focus for designers and their clients. The CSS Grid framework gives designers the ability to design for one flexible grid and optimize for devices across the entire spectrum. Not all designs can work with this framework; you have to design for it. So it turns out building a mobile website in 2011 and beyond isn’t so bad. 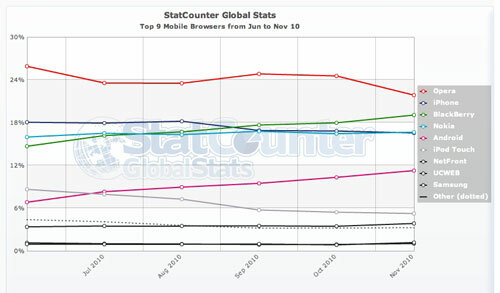 For the most part, mobile browsers now support HTML5 and CSS3 better than desktop browsers. Plus, there are all these open source frameworks to help you with the design and interactions. When it comes time to build your next mobile site, hopefully this article will eliminate the guesswork and help you make a great decision. Nick Francis builds websites with an outstanding team at Project83 in Nashville, Tennessee. He also co-founded Brightwurks that created web apps Feed My Inbox and Linkpatch, along with mobile website gallery Mobile Awesomeness. Great article Nick, really appreciate the useful resources you provided. Although I’m not currently planning to use them, they will seriously come in handy later on. Very good and extensive write-up Nick! The android simulator is terrible. It is so unbelievably slow and buggy, I can’t see how people can actually develop with it (I know no one who does, most people just push straight to device). I’ve only talked with some developer friends that don’t seem to mind it. I don’t have first-hand experience with it because it’s quite hard to install. Thanks for the tidbit :-). Great round-up, at my next project will really consider mobile first as it make sense. that stats are completely rubbish. there are several versions of BB os and its browsers (BB is not a browser!) and there is HUGE difference between bb os4 and bb os6. same for nokia. nokia is not a browser! nokia is mobile manufacturer. @gondo – correct, Blackberry, Nokia, iPhone, etc. are not browsers in themselves, but they are operating systems which all have default browsers installed. It is implied in the chart that the default browser from that OS is what is being used. Blackberry v4 and v6 browsers are entirely different as you say, v6 being based on WebKit and much better. However, that’s not what is being measured. Just like desktop browser share is often measured by IE as a whole instead of IE 6, IE7 and IE8, for this measurement it makes more sense not to fragment the data with version numbers. StatCounter’s stats are reputable and referenced industry-wide. I feel the graph presented still provides great insights into what mobile browsers are most used. Thanks for the comment! thanks for this great research! it is exactly what i have to put together at work, haha. Such an important roundup. We’ve just released our own web apps into mobile using JQuery Mobile, and found it to be a truly useful alternative while we develop our native apps in-house.